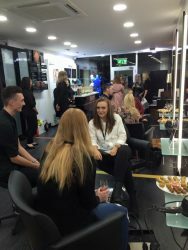 On Thursday 20th October, RUSH hosted a bloggers event to celebrate the opening of the new Nottingham salon. When the bloggers arrived they were handed a RUSH goodie bag, which included a voucher for a free Blow-dry and a glass of prosecco. The atmosphere in the salon was amazing, people walking past were coming in to ask what the fuss was about as the salon was extremely busy. Over Forty bloggers attended the exclusive event. During the evening, there were Stylists on hand which offered consultations and advice to anyone that wanted help with their hair. There were several GHD and Braiding stations available for the bloggers to try out. The Stylists created some amazing looks for the bloggers. Bloggers that attended the event, wrote positive reviews on their blogs about their evening at RUSH Nottingham. They expressed how much they enjoyed the evening and would recommend RUSH as a salon. The evening was a success. Everyone left the salon that evening excited for the grand opening that weekend.